After a home-cooked breakfast on the ranch, you’ll head out with your hosts for an interpreted tour of the property. Connect with the past at 5,000-year-old Blackfoot teepee rings, medicine wheels and the vision quest site sits up on the hilltop. This is the only twin medicine wheel site in North America, representing an important Blackfoot spiritual site. Standing there, you will no doubt feel its power. If you’re here in the late summer and early fall, watch for ripe juicy cactus berries to pick and eat along the way. 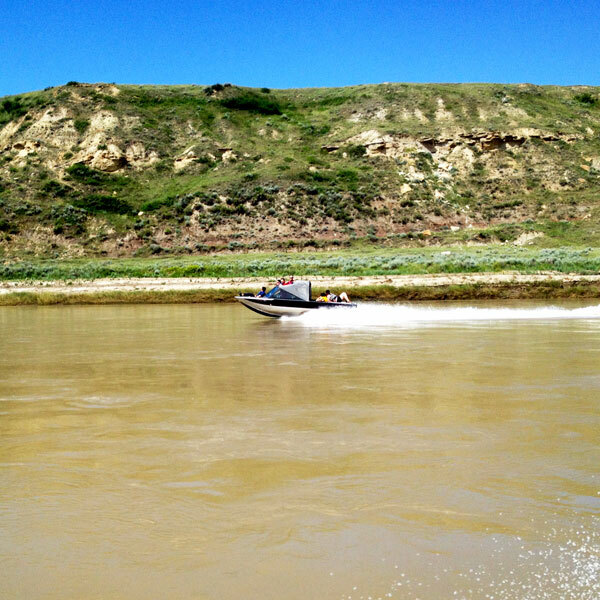 Savour a packed lunch overlooking the South Saskatchewan River – then board the Hern’s jet boat for an afternoon tour on the water. From the boat, you’ll see riverside wildlife – like elk, deer, coyotes and birds like heron, osprey and eagles – and extraordinary views that are only accessible down here. Along the banks, among the iconic Badlands hoodoos, you’ll encounter remnants of old stone homes built by pioneers in the mid-1800s. The only trails in this wild landscape are carved by thirsty elk and other wild animals making their way to the riverbank. After the river, you’ll travel back to the ranch for your evening meal and some well deserved relaxation. Tonight, you can hike the hills to the tops of the coulees or walk to the river to watch the sky change colour above you. You have never seen a sunset like a prairie sunset. The entire sky lights up in a cascade of colour. After dark, gather together again at the party barn – hand-built by Jim and Jay – for a game of pool, a movie or a cold beverage with your fellow travellers.